"Highway 401" redirects here. For other uses, see List of highways numbered 401. King's Highway 401, commonly referred to as Highway 401 and also known by its official name as the Macdonald–Cartier Freeway or colloquially as the four-oh-one, is a controlled-access 400-series highway in the Canadian province of Ontario. It stretches 828 kilometres (514 mi) from Windsor in the west to the Ontario–Quebec border in the east. The part of Highway 401 that passes through Toronto is North America's busiest highway, and one of the widest. Together with Quebec Autoroute 20, it forms the road transportation backbone of the Quebec City–Windsor Corridor, along which over half of Canada's population resides and is also a Core Route in the National Highway System of Canada. The route is maintained by the Ministry of Transportation of Ontario (MTO) and patrolled by the Ontario Provincial Police. The speed limit is 100 km/h (62 mph) throughout its length, with the only exceptions the posted 80 km/h (50 mph) limit westbound in Windsor and in most construction zones. By the end of 1952, three individual highways were numbered "Highway 401": the partially completed Toronto Bypass between Weston Road and Highway 11 (Yonge Street); Highway 2A between West Hill and Newcastle; and the Scenic Highway between Gananoque and Brockville, now known as the Thousand Islands Parkway. These three sections of highway were 11.8, 54.7 and 41.2 km, (7.3, 34.0 and 25.6 mi), respectively. In 1964, the route became fully navigable from Windsor to the Ontario–Quebec border. In 1965 it was given a second designation, the Macdonald–Cartier Freeway, in honour of two Fathers of Confederation. At the end of 1968, the Gananoque–Brockville section was bypassed and the final intersection grade-separated near Kingston, making Highway 401 a freeway for its entire 817.9-km length. On August 24, 2007, the portion of the highway between Glen Miller Road in Trenton and the Don Valley Parkway / Highway 404 Junction in Toronto was designated the Highway of Heroes, as the road is travelled by funeral convoys for fallen Canadian Forces personnel from CFB Trenton to the coroner's office in Toronto. On September 27, 2013, the Highway of Heroes designation was extended west to Keele Street in Toronto, to coincide with the move of the coroner's office to the new Forensic Services and Coroner's Complex at the Humber River Hospital. In 2011, construction began on a westward extension called the "Rt. Hon. Herb Gray Parkway". This new route follows but does not replace, the former Highway 3 between the former end of the freeway and the E. C. Row Expressway, at which point it turns and parallels that route towards the site of the future Gordie Howe International Bridge. An 8-kilometre (5 mi) section of the parkway, east of the E. C. Row interchange, opened on June 28, 2015, with the remaining section completed and opened on November 21. Elsewhere in Ontario, plans are underway to widen the remaining four-lane sections between Windsor and London to six lanes and to widen the route between Kitchener and Milton as well as through Oshawa. The expansive twelve-plus-lane collector–express system will also be extended west through Mississauga to Milton and east through Ajax and Whitby. Highway 401 at Weston Road has volumes of over 500,000 vehicles per day during the summer months, making it one of the busiest stretch of highway in the world. Highway 401 extends across Southwestern, Central and Eastern Ontario. In anticipation of the future expansion of the highway, the transportation ministry purchased a 91.4-metre-wide (300 ft) right-of-way along the entire length. Generally, the highway occupies only a portion of this allotment. It is one of the world's busiest highways; a 2016 analysis stated the annual average daily traffic (AADT) count between Weston Road and Highway 400 in Toronto was nearly 420,000, while a second study estimates that over 500,000 vehicles travel that section on some days. This makes it North America's busiest roadway, surpassing the Santa Monica Freeway in Los Angeles and I-75 in Atlanta. The just-in-time auto parts delivery systems of the highly integrated automotive industry of Michigan and Ontario have contributed to the highway's status as the world's busiest truck route, carrying 60 percent of vehicular trade between Canada and the US. Highway 401 also features North America's busiest multi-structure bridge at Hogg's Hollow in Toronto. The four bridges, two for each direction with the collector and express lanes, carried an average of 373,700 vehicles daily in 2006. The highway is one of the major backbones of a network in the Great Lakes region, connecting the populous Quebec City–Windsor corridor with Michigan, New York and central Ontario's cottage country. It is the principal connection between Toronto and Montreal, becoming Autoroute 20 at the Ontario–Quebec border. The Highway 401 extension in Windsor, opened in 2015, is a six-lane below-grade roadway with tunnels and greenspace. It will connect to the planned Gordie Howe International Bridge. Highway 401 does not yet extend the last few kilometres to Detroit; an extension to Brighton Beach (at the Canada–US border in Windsor) was completed in November 2015, after which the Gordie Howe International Bridge will extend Highway 401 across the Canada–United States border to a connection through Delray to Interstate 75 in Michigan by the end of 2024. At present, Highway 401 begins as a six-lane freeway at the west end of the E. C. Row Expressway. At the Dougall Parkway, the highway turns east and exits Windsor. From here, Highway 401 mostly parallels the former route of Highway 98 from Windsor to Tilbury. Highway 401 widens to six lanes at Highway 402 in London. Southwestern Ontario is flat, primarily agricultural land, that takes advantage of the fertile clay soil deposited throughout the region. The main river through the region is the Thames River, which drains the second largest watershed in southern Ontario and largely influences the land use surrounding the highway; It parallels the route to the north between Tilbury and Woodstock. Near Tilbury, Highway 401 loses its tall wall median barrier and narrows to four lanes, following lot lines laid between concession roads in a plan designed to limit damage to the sensitive agricultural lands through which the highway runs. Here the highway's flat and straight route is notorious for leading to driver inattention. The section from Windsor to London (especially west of Tilbury) has become known for deadly car accidents and pile-ups, earning it the nickname Carnage Alley. As the highway approaches London, Highway 402 merges in, resulting in a six-lane cross-section. Within London, it intersects the city's two municipal expressways, Highbury Avenue and the Veterans Memorial Parkway. The section between London and Woodstock generally parallels the former Highway 2 but lies on the south side of the Thames River. This area is not as flat but the highway is generally straight. This part of Highway 401 often experiences heavy snowsqualls in early winter, sometimes extending as far east as Toronto. To the south of Woodstock, Highway 401 curves northeast and encounters the western terminus of Highway 403. The highway heads towards Kitchener and Cambridge, where it encounters Highway 8 and returns to its eastward orientation. East of Cambridge, the highway meanders towards Milton, passing through hills and rock cuts along the way. Traffic cameras are mounted at every exit within Toronto and form one part of the COMPASS system. "The Basketweave", just east of the Highway 400 interchange, is a free-flowing crossover between the collector and express lanes. 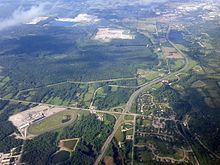 As Highway 401 approaches the Greater Toronto Area (GTA), it descends through the ecologically protected Niagara Escarpment to the west of Milton. Upon entering the town, it enters the first urbanized section of the GTA, passing through two rural areas between there and Oshawa. The first rural gap is the western side of Toronto's Greenbelt, a zone around Toronto protected from development. After this 10 km (6.2 mi) gap, the highway interchanges with the Highway 407 Express Toll Route. Within the GTA, the highway passes several major shopping malls including Yorkdale Shopping Centre, Scarborough Town Centre and Pickering Town Centre. Highway 401 widens into a collector-express system as it approaches Hurontario Street in Mississauga, a concept inspired by the Dan Ryan Expressway in Chicago. The system divides each direction of travel into collector and express lanes, giving the highway a wide span and four carriageways. To avoid confusion between carriageways, blue signs are used for the collector lanes and green signs for the express lanes. Unlike the collector lanes, which provide access to every interchange, the express lanes only provide direct access to a select few interchanges. Access between the two is provided by transfers, which are strategically placed to prevent disruptions caused by closely spaced interchanges. The overall purpose of the collector-express system is to maximize traffic flow for both local and long-distance traffic. In addition, Highway 401 was equipped with a traffic camera system called COMPASS in early 1991. Using closed-circuit television cameras, vehicle detection loops and LED changeable-message signs, COMPASS enables the MTO Traffic Operations Centre to obtain a real-time assessment of traffic conditions and alert drivers of collisions, congestion and construction. The system stretches from the Highway 403 / 410 interchange in Mississauga to Harwood Avenue in Ajax. Two sets of collector-express systems exist in the GTA. The first set is 6.6 km (4.1 mi) long and connects Highway 403, Highway 410 and Highway 427. This system primarily serves to accommodate and organize various traffic movements from the Highway 403 / 410 and Highway 427 interchanges along Highway 401, replacing an earlier plan that would have run Highway 403 directly to Eglinton Avenue and the never-built Richview Expressway. East of the interchange with Renforth Drive, the collector lanes diverge to become the on-ramps to Highway 427 northbound and southbound. The second 43.7 km (27.2 mi) system passes through the centre of Toronto and ends in Pickering to the east. The 5 km (3.1 mi) gap between the two systems is a traffic bottleneck. However, the interchange cannot accommodate future widening of Highway 401. Highway 401 widens to 18 lanes south of Toronto Pearson International Airport. Progressing eastward, eight lanes are carried beneath the large spaghetti junction at Highway 427. The highway curves northeast and follows a power transmission corridor to Highway 409, which merges with the mainline and forms the collector lanes. It returns to its eastward route through Toronto, now carrying 12–16 lanes of traffic on four carriageways. Highway 401 is often congested in this section, with an average of 442,900 vehicles passing between Weston Road and Highway 400 per day as of 2008. In spite of this congestion, it is the primary commuting route in Toronto; over 50 percent of vehicles bound for downtown Toronto use the highway. Different colours are used on the signs on Highway 401's collector-express system to avoid confusion. The express lanes use green signs and the collector lanes use blue. These particular signs are at The Basketweave. East of Highway 400 is The Basketweave, a criss-crossing transfer between the express and collectors carriageways, beyond which is Yorkdale Centre. Twelve lanes pass beneath a complicated interchange with Allen Road, built to serve the cancelled Spadina Expressway. Further east, the highway crosses Hogg's Hollow, over the West Don River and Yonge Street in the centre of Toronto, the busiest multi-span bridge crossing in North America, surpassing the Brooklyn Bridge. It then crosses the East Don River and climbs toward the Don Valley Parkway, which provides access to downtown Toronto and Highway 404, which provides access to the suburbs to the north. Progressing eastward, the highway continues through mostly residential areas in Scarborough, eventually reaching the Rouge Valley on the city's eastern edge and crossing into Pickering. West of Pickering, Highway 401 again meets former Highway 2, which thereafter parallels it to the Ontario–Quebec border. As the highway approaches Brock Road in Pickering, the collector and express lanes converge, narrowing the 14-lane cross-section to 10, divided only at the centre. It remains this width as it passes into Ajax, before narrowing to six lanes at Salem Road. Planned expansions east of Salem to improve flow leading into the Highway 412 and Lakeridge Road interchanges will see the highway widened to ten lanes as far as Brock Street in Whitby, where the existing interchange will be reconfigured. East of Ajax, the highway passes through the second 3.5 km (2.1 mi) rural gap, and enters Whitby. The stretch of Highway 401 through Whitby and Oshawa features several structures completed during the initial construction of the highway in the 1940s. Several of these structures are to be demolished, either due to their age, or to prepare for the planned widening of Highway 401 through this area. A former Canadian National Railway overpass, which was fenced off but commonly used by pedestrians during Highway of Heroes repatriations, was demolished on the night of June 11, 2011. A second structure in Bowmanville was demolished during two overnight closures on July 9 and 16. At Harmony Road, the suburban surroundings quickly transition to agricultural land. The highway curves around the south side of Bowmanville and travels towards Highway 35 and Highway 115. Traffic congestion on Highway 401 east of Toronto. During rush hours and holidays, Highway 401 eastbound suffers from severe traffic jams as the collector-express system ends between Pickering and Ajax, causing a traffic bottleneck. Through much of eastern Ontario, Highway 401 is rural freeway with a grass median. From east of Highway 35 and Highway 115 to Cobourg, Highway 401 passes through a mix of agricultural land and forests, maintaining a straight course. Just east of Cobourg, the highway narrows to four lanes and the terrain becomes undulating, with the highway routed around hills and through valleys along the shores of Lake Ontario. At Trenton, the highway crosses the Trent Canal and returns to an agricultural setting. It then crosses the Moira River as it goes through Belleville before heading eastward to Kingston. The Kingston portion of the highway, originally named the Kingston-Bypass, was one of the first sections of the highway to be completed; it is now mostly three lanes each way. East of Kingston, the highway continues through a predominantly agricultural area alongside the Saint Lawrence River to Gananoque, where it splits with the Thousand Islands Parkway, one of the original sections of the highway designated in 1952. The current Highway 401 runs parallel to the parkway several kilometres inland from the river. The Canadian Shield, an ancient geological formation, appears through this heavily forested section of the highway. Highway 401 rejoins the Thousand Islands Parkway immediately southwest of Brockville, now heading northeast. The remainder of the highway runs parallel to the former Highway 2 along the shore of the Saint Lawrence River within the Saint Lawrence Valley. Northeast of Brockville is the interchange with Highway 416, which heads north to Ottawa. At the Ontario–Quebec border, Highway 401 becomes Autoroute 20 and continues to Montreal. The MTO publishes yearly traffic volume data for provincial highways, expressed as an average daily vehicle count over the span of a year (AADT). The table below compares the AADT at several locations along Highway 401 using data from 1969, 1988, 2008 and 2016. Highway 401's history predates its designation by over two decades. As automobile use in southern Ontario grew in the early 20th century, road design and construction advanced significantly. Following frequent erosion of Lake Shore Road, then macadamized, a concrete road known as the Toronto–Hamilton Highway was proposed in January 1914. Construction began on November 8 of that year, following the onset of World War I. The highway was designed to run along the lake shore, instead of Dundas Street to the north, because the numerous hills encountered along Dundas would have increased costs without improving accessibility. Middle Road, a dirt lane named because of its position between the two, was not considered since Lake Shore and Dundas were both overcrowded and in need of serious repairs. The road was formally opened on November 24, 1917, 5.5 m (18 ft) wide and nearly 64 km (40 mi) long. It was the first concrete road in Ontario, as well as one of the longest stretches of concrete road between two cities in the world. Over the next decade, vehicle usage increased substantially, and by 1920 Lakeshore Road was again congested, particularly during weekends. In response, the Department of Highways examined improving another road between Toronto and Hamilton. The road was to be more than twice the width of Lakeshore Road at 12 m (39 ft) and would carry two lanes of traffic in either direction. Construction on what was then known as the Queen Street Extension west of Toronto began in early 1931. Before the highway could be completed, Thomas McQuesten was appointed the new minister of the Department of Highways, with Robert Melville Smith as deputy minister, following the 1934 provincial elections. Smith, inspired by the German autobahns—new "dual-lane divided highways"—modified the design for Ontario roads, and McQuesten ordered the Middle Road be converted into this new form of highway. A 40 m (130 ft) right-of-way was purchased along the Middle Road and construction began to convert the existing sections to a divided highway. Work also began on Canada's first interchange at Highway 10. The former Highway 2A near Highland Creek, aside from a resurfaced pavement, has not been altered since it opened in 1947. Beginning in 1935, McQuesten applied the concept of a dual-highway to several projects along Highway 2, including along Kingston Road in Scarborough Township. When widening in Scarborough reached the Highland Creek ravine in 1936, the Department of Highways began construction on a new bridge over the large valley, bypassing the former alignment around West Hill. From here the highway was constructed on a new alignment to Oshawa, avoiding construction on the congested Highway 2. As grading and bridge construction neared completion on the new highway between West Hill and Oshawa in September 1939, World War II broke out and gradually tax revenues were re-allocated from highway construction to the war effort. At the same time, between September 6 and 8, 1939, the Ontario Good Roads Association Conference was held at Bigwin Inn, near Huntsville, drawing highway engineers from across North America to discuss the new concept of "Dual Highways." On the first day of the convention, McQuesten announced his vision of the freeway: an uninterrupted drive through the scenic regions of Ontario, discouraging local business and local traffic from accessing the highway except at infrequent controlled-access points. It was announced in the days thereafter this concept would be applied to a new "trans-provincial expressway", running from Windsor to the Ontario–Quebec border. Highway engineers evaluated factors such as grading, curve radius, and the narrow median used along the Middle Road—which was inaugurated on August 23, 1940 as the Queen Elizabeth Way (QEW)—and began to plan the course of a new dual highway mostly parallel to Highway 2, with precedence given to areas most hampered by congestion. Unlike the QEW, this highway would not be built along an existing road, but rather on a new right-of-way, avoiding the need to provide access to properties. Along with immense improvements to machinery and construction techniques over its six-year course, the war provided planners an opportunity to conduct a survey of 375,000 drivers, asking them about their preferred route to travel to their destination. Using this information, a course was plotted from Windsor to Quebec, bypassing all towns along the way. Highway 2S (S for Scenic) was the first completed section of new roadway. Built to connect with the Thousand Islands Bridge at Ivy Lea and opened as a gravel road in late 1941 or early 1942, the road followed the shore of the Saint Lawrence River and connected with the western end of the twinned Highway 2 near Brockville. In addition, the highway between Highland Creek and Oshawa was opened as a gravel-surfaced road in May 1942. Following the war, construction resumed on roadways throughout Ontario. The expressway between Highland Creek and Oshawa was completed in December 1947, while other sections languished. The Toronto–Barrie Highway was the primary focus of the Department of Highways at the time, and the onset of the Korean War in 1950 stalled construction again. Despite the delays, highway minister George Doucett officially announced the plans for construction of the new trans-provincial expressway that year, with the Toronto to Oshawa expressway serving as a model for the design. Work on the most important link, the Toronto Bypass, began in 1951, but it would not open with that name. The Highway 400 interchange in 1953. 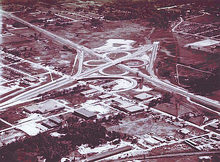 Today, the former cloverleaf has been replaced with a multilevel interchange. The widening of Highway 401 from four to twelve lanes in Toronto took nine years and was accomplished with at least four lanes open at all times. 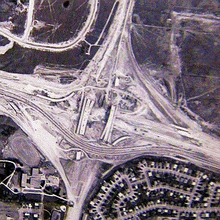 Shown here is the Highway 401 / Don Valley Parkway / Highway 404 interchange under construction in 1965. 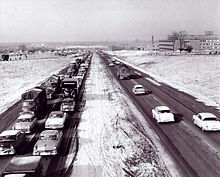 Within years after opening, the four-lane Toronto Bypass was congested, prompting the Department of Highways to widen this section to 12 lanes beginning in 1963. In July 1952 (possibly July 1, the same day Highway 400 was numbered),[a] the Highland Creek to Oshawa expressway and Highway 2S were designated Controlled-Access Highway No 401, a move scorned by one critic because of the lack of thought into the numbered name. Construction was completed for several sections of the Toronto Bypass: between Highway 400 and Dufferin Street in August, west to Weston Road in September, east to Bathurst Street in October and finally to Yonge Street in December. Extensions east and west began in 1953; the eastern extension to Bayview Avenue opened in April 1955, but the western extension was delayed by the damage caused by Hurricane Hazel on October 15, 1954, which nearly destroyed the new bridge over the Humber River. The reconstruction would take until July 8, 1955, and the highway was opened between Weston and Highway 27 in September 1955. The entire bypass, including the widening of Highway 27 into an expressway south of Highway 401, was completed in August 1956. Upon its opening, the bypass was described by one reporter as "a motorist's dream" providing "some of the most soothing scenery in the Metropolitan area". The reporter continued, with regard to the eastern section through Scarborough, that it "winds smoothly through pastures across streams and rivers, and beside green thickets. It seems a long way from the big city." By 1959 however, the bypass was a lineup of cars, as 85,000 drivers crowded the roadway, designed to handle a maximum of 48,000 vehicles, on a daily basis. Motorists found the new road to be a convenient way of travelling across Toronto; this convenience helped influence the suburban shift in the city and continues to be a driving force of urban sprawl today. Meanwhile, beyond Toronto, the highway was being built in a patchwork fashion, focusing on congested areas first. Construction west from Highway 27 began in late 1954, as did the Kingston Bypass in Eastern Ontario. Work began to connect the latter with the Scenic Highway in 1955. After the 1954 New York State Thruway opened from Buffalo to New York City, Michigan officials encouraged Ontario to bypass Highway 3 as the most direct path from Detroit to Buffalo. By 1956, construction had begun on a segment between Highway 4 in London and Highway 2 in Woodstock, as well as on the section between Windsor and Tilbury. A plaque near Brockville commemorates the official completion of the highway. In 1958, a section bypassing Morrisburg was opened to accommodate traffic displaced from a portion of Highway 2 through The Lost Villages of the Saint Lawrence Seaway. Highway 2 would ultimately be reopened on a new alignment which followed the CN rail right-of-way. 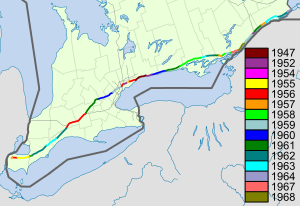 By the end of 1960, the Toronto section of the highway was extended both eastwards and westwards: first, to the east between Newcastle and Port Hope on June 30, then later to the west between Highway 25 in Milton and Highway 8 south of Kitchener on November 17. By mid-1961, the section between Brighton and Marysville had opened. The gap to the east, from Highway 28 in Port Hope to Highway 30 in Brighton was opened on July 20, 1961. The gap between Woodstock and Kitchener was completed on November 9, 1961, while the gap between Tilbury and London was completed two lanes at a time; the northbound lanes on October 22, 1963, the southbound on July 20, 1965. The gap between Marysville and Kingston was opened by 1962. The final sections, from west of Cornwall to Lancaster, were opened between 1962 and 1964; two lanes opened to Lancaster on September 11, 1962, but the other two were not completed until July 31, 1964. The last segment, to the Ontario–Quebec border, was opened on November 10, 1964. Finally, on October 11, 1968, the Thousand Islands Bypass opened. This final piece was commemorated with a plaque to signify the completion of Highway 401. In Toronto, engineers and surveyors were examining the four-lane bypass, while planners set about designing a way to handle the commuter highway. In 1963, transportation minister Charles MacNaughton announced the widening of Highway 401 in Toronto from four to a minimum of 12 lanes between Islington Avenue and Markham Road. The design was taken from the Dan Ryan Expressway in Chicago, which was widened into a similar configuration around the same time. Construction began immediately. While the plan initially called for construction to end in 1967, it continued for nearly a decade. At least four lanes were always open during the large reconstruction project, which included complex new interchanges at Highway 27, Highway 400, the planned Spadina Expressway and the Don Valley Parkway. The system was completed in 1972, along with the Highway 27 (renamed Highway 427) bypass between the QEW and Pearson Airport. Most of the interchanges in Toronto were reconstructed as partial cloverleafs and a continuous lighting system was installed. 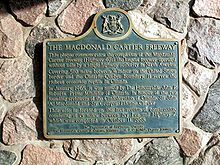 On January 11, 1965, at the dinner celebration of Sir John A. Macdonald's 150th birthday, the Premier of Ontario John Robarts designated Highway 401 the Macdonald–Cartier Freeway to honour Macdonald and George-Étienne Cartier, two of Canada's Fathers of Confederation. Unlike other names later applied to the highway, the Macdonald–Cartier Freeway designation covers the entire length of Highway 401. Signs designating the freeway and shields with the letters 'M-C' were installed, but these had been removed by 1997. In 2003, 38 years after Robarts' naming of the highway, a Member of Provincial Parliament attempted to get the Macdonald-Cartier Freeway highway name enshrined into law; the bill only passed first reading and was not enacted. In the 1970s, Highway 401 was widened to six lanes in Durham, but otherwise saw little improvement. The 1980s saw more sections widened, as well as a new collector-express system between Highway 403 / 410 and Highway 427 completed in mid-1985. Plans were made to extend the eastern system from Neilson Road to Brock Road in Pickering in the late 1980s, but took over a decade to reach fruition by 2000. This was followed shortly thereafter by the widening of the highway through Ajax and a new interchange at Pickering Beach Road (renamed Salem Road) and Stevenson Road. The 1990s also saw the first step in widening the highway to six lanes from Toronto to London. A project in the mid-1990s brought the highway up to a minimum of six lanes between Highway 8 in Kitchener and Highway 35 / 115 in Newcastle. Other projects prepared sections for eventual widening. In 1993, the stretch of Highway 401 eastbound near Milton and westbound near Whitby had chevrons painted in each lane in an effort to reduce tailgating, a concept borrowed from France and Britain. Signs advised motorists to keep at least two chevrons apart, in essence warning them not to follow too closely. Some of these chevrons remained intact in the westbound lanes in Whitby until 2012, though the signs stating their use had been removed. Beginning in 1998, several projects were initiated on Highway 401 within Toronto. These included the addition of one lane through the Highway 427 interchange in 2005, as well as the resurfacing of the pavement through the city. Between June 1990 and 1998, Highway 401 and Interstate 75 were used for a pilot project named Advantage I-75 to test the reliability and versatility of an automated tracking system for transport trucks. Termed "MACS" (Mainline Automated Clearance System), it allows a truck to travel from Florida to Ontario without a second inspection. MACS was initially tested at two truck inspection stations in Kentucky, with transponders installed in 220 trucks. Exact time, date, location, weight and axle data were logged as a truck approached an equipped station. Following initial tests, MACS was deployed at every inspection station along I-75 from Miami to Detroit, and along Highway 401 from Windsor to Belleville in 1994. The project demonstrated the effectiveness of electronic systems in enforcing freight restrictions without delaying vehicles, while alleviating security fears such systems could be compromised. The concept has since been applied to many parts of Canada, including Highway 407's electronic tolling system. The section of Highway 401 between Windsor and London has often been referred to as Carnage Alley, in reference to the numerous crashes that have occurred throughout its history. The term became more commonplace following several deadly pileups during the 1990s. The narrow and open grass median was an ineffective obstacle in preventing cross-median collisions. The soft shoulders consisted of gravel, with sharp slopes which were blamed for facilitating vehicle rollovers. The nature of that section of highway, described as a mainly straight road with a featureless agricultural landscape, was said to make drivers feel less involved and lose focus on the road. In winter, the area between Woodstock and Chatham is also subject to sudden snow squalls from lake-effect snow. Several collisions have resulted from motorists deviating from their lane and losing control of their vehicles. Various other names, including The Killer Highway circulated for a time, but Carnage Alley became predominant following an 87-vehicle pile-up on September 3, 1999 (the start of Labour Day weekend), the worst in Canadian history, that resulted in eight deaths and 45 injured individuals. Only a few days prior, then-Transportation Minister David Turnbull had deemed the highway "pleasant" to drive. On the morning of September 3, the local weather station reported clear conditions due to a malfunction, while a thick layer of fog rolled onto the highway. Dozens of vehicles, including several semi-trailers, quickly crashed into each other shortly after 8 a.m., one following another in the dense fog, and the accumulating wreckage caught traffic travelling in the opposite direction. Immediately following the crash, the MTO installed paved shoulders with rumble strips and funded additional police to patrol the highway, a move criticized as being insufficient. Beginning in 2004, 46 km (29 mi) of the highway was widened from four asphalt lanes to six concrete lanes, paved shoulders were added, a concrete Ontario Tall Wall median was installed, which was the solution the Canadian Automobile Association promoted in 1999. Interchanges were improved and signage was upgraded as part of a five-phase project to improve Highway 401 from Highway 3 in Windsor to Essex County Road 42 (formerly Highway 2) on the western edge of Tilbury. "Highway of Heroes" redirects here. For other uses, see List of highways named Highway of Heroes. Canadians line overpasses along the Highway of Heroes to pay their respects to fallen soldiers. On August 24, 2007, the MTO announced the stretch of Highway 401 between Glen Miller Road in Trenton and the intersection of the Don Valley Parkway and Highway 404 in Toronto would bear the additional name Highway of Heroes (French: Autoroute des héros), in honour of Canadian soldiers who have died, though Highway 401 in its entirety remains designated as the Macdonald–Cartier Freeway. This length of the highway is often travelled by a convoy of vehicles carrying a fallen soldier's body, with his or her family, from CFB Trenton to the coroner's office at the Centre for Forensic Sciences in Toronto. Since 2002, when the first fallen Canadian soldiers were repatriated from Afghanistan, crowds have lined the overpasses to pay their respects as convoys pass. The origin of the name can be traced to an article in the Toronto Sun on June 23, 2007, by columnist Joe Warmington, in which he interviewed Northumberland photographer Pete Fisher. Fisher, along with Bob Jenkins, an emergency dispatcher, were responsible for organizing the first bridge salutes following the loss of four soldiers on April 18, 2002. Warmington described the gathering of crowds on overpasses to welcome fallen soldiers as a "highway of heroes phenomena". This led a Cramahe Township volunteer firefighter to contact Fisher on July 10 about starting a petition, leading Fisher to publish an article which was posted to the Northumberland Today website. The online article eventually caught the attention of London resident Jay Forbes. Forbes began a petition, which received over 20,000 signatures before being brought to the Minister of Transportation on August 22. Following the announcement on August 24, the provincial government and MTO set out to design new signs. The signs were erected and unveiled on September 7, and include a smaller reassurance marker (shield), as well as a larger billboard version. Highway 401 was closed during a series of propane explosions in Toronto in 2008, allowing for this rare photo of the 14-lane highway occupied by a single vehicle. On August 10, 2008, following a series of explosions at a propane facility in Toronto, Highway 401 was closed between Highway 400 and Highway 404 as a precautionary measure, the largest closure of the highway in its history. The highway remained closed until 8 p.m., though several exits near the blast remained closed thereafter. Between 2006 and 2008, Highway 401 was widened from four to six lanes between Highway 402 and Wellington Road in London. This included replacing the original Wellington Road overpass. In Oshawa, exit 416 (Park Road) was replaced by a new interchange at exit 415 (Stevenson Road). The contract, which began September 7, 2005, included the interchange and the resurfacing of 23.4 km (14.5 mi) of the highway between Oshawa and Highway 35 / Highway 115. The westbound ramps were opened in mid-September 2007 and the eastbound ramps in mid-2009. The resurfacing was completed mid-2010. In November 2010, the widening of Highway 401 from four to six lanes between Woodstock and Kitchener was completed after many years of planning and construction. The project included the installation of a tall-wall median barrier, straightening curves and adding additional interchanges on the freeway, allowing it to be easily vacated in an emergency event. In 2004, a joint announcement by the federal government of the United States and Government of Canada confirmed a new border crossing would be constructed between Detroit and Windsor. The Detroit River International Crossing (DRIC) was formed as a bi-national committee to manage the project. The MTO took advantage of this opportunity to extend Highway 401 to the Canada–US border and began an environmental impact assessment on the entire project in late 2005. The City of Windsor also hired New York traffic consultant Sam Schwartz to design a parkway to the border. Schwartz's proposal would eventually inspire the DRIC's own design, but his route was not chosen, with the DRIC opting instead to take a northern route. On February 8, 2008, the MTO announced it had begun purchasing property south of the E.C. Row Expressway, upsetting many area residents who had purchased properties in the years prior. On March 3, 2008, the Michigan Department of Transportation and the MTO (in partnership with Transport Canada, the Federal Highway Administration of the United States and the Detroit River International Crossing group) completed a joint assessment on the soils along the Detroit River and determined they could indeed support the weight of a new bridge; the stability of the underlying soil and clay and the impact of the nearby Windsor Salt Mine had caused concern for all parties involved in the project. Despite protest from area residents, as well as a dismissed lawsuit from Ambassador Bridge owner Matty Moroun, it was announced on May 1, 2008, that a preferred route had been selected and the new route would be named the Windsor–Essex Parkway. The new parkway is below-grade and has six through-lanes. It follows (but does not replace) Talbot Road and Huron Church Road from a new interchange at the former end of Highway 401 to the E. C. Row Expressway, where it runs concurrently westward for 2 km (1.2 mi). From there, it turns northwest and follows a new alignment to the border. Initial construction of a noise barrier from North Talbot Road to Howard Avenue began in March 2010; full construction began on August 19, 2011. On November 28, 2012, the Ministry of Transportation announced a Federal Order in Council was passed to change the name of the parkway to the "Rt. Hon. Herb Gray Parkway", in honour of the Right Honourable Herb Gray, a Member of Parliament from Windsor. In early 2015, it was announced the parkway would open to traffic between Highway 3 and Labelle Street (near the E. C. Row Expressway) in the spring; an 8-kilometre (5 mi) section was opened to traffic on June 28, extending Highway 401 as far west as the E. C. Row Expressway. It was the first new segment of the highway to be opened since the Thousand Islands Bypass in 1968. The stretch to Ojibway Parkway was opened on November 21, completing the parkway as far as the planned bridge approach and border plaza. Construction on projects related to the Gordie Howe International Bridge began in 2015 with an initial completion date in 2019–20. The "Bridging North America" consortium was selected to build the bridge in July 2018. Minor construction began immediately and major construction began in fall 2018. The Gordie Howe International Bridge is expected to be completed by the end of 2024. The stretch of Highway 401 in Greater Toronto has seen dense development in recent years. In 2007 Minister of Transportation Donna Cansfield commented the MTO intends to widen all of the remaining four-lane sections to a minimum of six. With no dates set for construction or completion, this is a tentative announcement for the long-term future. In Southwestern Ontario, several improvements are under way to provide six lanes on Highway 401 from Windsor to Toronto, in response to the 1999 Highway 401 crash in Carnage Alley. West of Essex County Road 42 on the west of Tilbury, the highway has been widened to six lanes with a concrete divider in anticipation of the Rt. Hon. Herb Gray Parkway. Highway 401 between Highway 4 and Highway 402 is being reconstructed and now includes a new interchange with Wonderland Road. This photo was taken from the Westminster Drive overpass which was demolished on July 5, 2014, to prepare for the widening of the highway west towards Highway 4. Within the London area, traffic volumes are expected to increase considerably, leading to poor highway conditions. The province has put in place an extensive plan to widen and reconstruct the London corridor between 2006 and 2021. This included building a new interchange with Wonderland Road which opened in November 2015 to help improve access to Highway 401 westbound from the city's southwest end and involved replacing the Westminster Drive overpass to allow the highway to be widened. The Westminster Drive overpass was demolished on July 5, 2014. This project will coincide with reconstructing the outdated cloverleaf interchange at Colonel Talbot Road and widening Highway 401 from four to six lanes between Highway 4 and Highway 402. The MTO is also planning on widening Highway 401 from six to eight lanes through part of the London corridor. Long-term plans call for Highway 401 in the Waterloo region to be widened to eight to ten lanes as well. Work began on June 8, 2015 to widen the highway from six to ten lanes between Highway 8 and Hespeler Road in Cambridge. The interchange between Highway 401 and Highway 8 (King Street) is to be reconstructed to make it free-flowing for all directions of travel. Highway 401 in the Greenbelt. The stretch of Highway 401 between Highway 8 and Highway 407 ETR is slated to be widened from six to ten lanes, including two HOV lanes. Work is underway to expand Highway 401 from six to twelve lanes from Hurontario Street to the Credit River by 2019, consisting of a collector-express system with HOV lanes. Pictured is Highway 401 near Mavis Road in 2012. In its 2007 plan for southern Ontario, the MTO announced long-term plans to create high-occupancy vehicle (HOV) lanes from Mississauga Road west to Milton; by 2011 these plans had been expanded in scope to as far west as Hespeler Road in Cambridge. By 2014 construction was completed widening Highway 401 to a collector-express system from Highway 403 and Highway 410 to west of Hurontario Street, a distance of 2.8 km (1.7 mi). Construction is currently underway to widen the highway to a collector–express system from west of Hurontario Street to the Credit River, as well as for the addition of the final ramps at the 401/403/410 interchange to allow full access to and from Highways 403 and 410. A successful construction consortium is expected to be announced in 2019, for further widening from the Credit River to Regional Road 25 in Milton. This project will include a collector–express system between the Credit River and James Snow Parkway in Milton, with the exception of the portion west of Winston Churchill Boulevard through the Highway 407 interchange, which — along with the portion from James Snow Parkway to Regional Road 25 — will be widened to 10 lanes. All portions of this expansion will include an HOV lane. Within Toronto, some projects have been completed during overnight construction projects, including the widening and rehabilitation of the Hogg's Hollow bridge, the replacement of the original gantries throughout the collector-express system, and reconstructing the Highway 401 / 400 interchange. Expansion plans in Durham include the construction of two new freeways north from Highway 401. Highway 412 is directly east of Lakeridge Road, while Highway 418 will lie to the east of Courtice Road. Alongside the extension of Highway 407, Highway 401 is being widened to 12 lanes, forming an extension to the current collector-express system, from its end at Brock Road in Pickering to Brock Street in Whitby. In addition, a partial interchange has been constructed at Lakeridge Road, with westbound entrance and eastbound exit ramps. In order to accommodate the ramps for Highway 412, the highway has been shifted north at the interchange under construction. Long-term plans also call for HOV lanes to run from Brock Road to Harmony Road, though no planning has commenced. However, there has been an environmental assessment on widening highway 401, extending the collector-express system east towards Salem Road in Ajax and to 10 lanes from Brock Street in Whitby, to Courtice Road in the Municipality of Clarington. The assessment was completed in March 2015. All the original World War II era overpasses dating back in the 1940s and 1950s built between Whitby and Oshawa will gradually be replaced with new overpasses as part of modern highway safety standards and to allow highway widening sometime in the future. East of Durham, the MTO is planning to widen parts of Highway 401 to six lanes. Preliminary work includes the widening of the bridge over the Trent River in Trenton, as well as the realignment of some roads alongside the highway. By 2012, the highway was widened to six lanes for 9 km (5.6 mi) through Kingston between exits 611 and 619. Construction began in 2014 to expand the highway to six lanes approximately five kilometres (3.1 mi) east of exit 474 in Cobourg. This was completed in the summer of 2017. Highway 401 features 19 service centres controlled by the MTO. These service centres were announced in 1961 following public outcry over the lack of rest stops. They provide a place to park, rest, eat and refuel 24 hours a day. The centres were originally leased to and operated by several major gasoline distributors; however, those companies have chosen not to renew their leases as the terms ended. In response, the MTO put the operation of the full network of service centres out for tender, resulting in a 50-year lease agreement in 2010 with Host Kilmer Service Centres, a joint venture between hospitality company HMSHost (a subsidiary of Autogrill) and Larry Tanenbaum's investment company Kilmer van Nostrand, which operates the rest areas under the ONroute brand. Seventeen of the centres along Highway 401 have been reconstructed entirely. Two centres rebuilt in the late 1990s, specifically Newcastle and Ingersoll, were not redeveloped at that time. Work on rebuilding 15 of the 17 service centres began in late 2009 or early 2010. The new service centres, opened in phases beginning in July 2010, feature a Canadian Tire gas station, an HMSHost-operated convenience store known as "The Market", as well as fast food brands such as Tim Hortons, A&W, Pizza Pizza, Extreme Pita, KFC, Taco Bell, Big Smoke Burger and Burger King. Ingersoll Westbound 222, 230 Will not be redeveloped at this time. Leased by Imperial Oil. Cambridge North reopened June 25, 2013; Cambridge South reopened July 23, 2013. Newcastle Westbound 440, 448 Will not be redeveloped at this time. Leased by Imperial Oil. Mallorytown South Eastbound 685 Reopened June 28, 2012. The following table lists the major junctions along Highway 401, as noted by the Ministry of Transportation of Ontario. 180 Highway 4 north (Wonderland Road) Construction begun in early 2014, opened November 2015. Highway 4 re-routed along Wonderland Road in 2018. 211.0 340 Mavis Road Exit opened in 1999. Heavy Rescue: 401 - a documentary/reality series on Discovery Channel showcasing the operations of heavy rescue and recovery towing businesses along the highway and nearby roads. ^ The Department of Highways Fiscal Report for the year ending March 31, 1952, claims "Controlled Access Highways nos. 400 and 401 were signed". However, all other sources claim July. ^ a b c d e f g h i Ministry of Transportation and Communications (1972). pp. 8–9. ^ a b c d e f g h Ministry of Transportation of Ontario (2008). "Annual Average Daily Traffic (AADT) counts". Government of Ontario. Archived from the original on June 28, 2011. Retrieved October 1, 2013. ^ Allen, Paddy (July 11, 2011). "Carmageddon: the world's busiest roads". The Guardian. Guardian News & Media Ltd. Archived from the original on July 15, 2014. Retrieved July 11, 2014. ^ a b Maier, Hanna (October 9, 2007). "Chapter 2". Long-Life Concrete Pavements in Europe and Canada (Report). Federal Highway Administration. Archived from the original on May 27, 2010. Retrieved May 1, 2010. The key high-volume highways in Ontario are the 400-series highways in the southern part of the province. The most important of these is the 401, the busiest highway in North America, with average annual daily traffic (AADT) of more than 425,000 vehicles in 2004 and daily traffic sometimes exceeding 500,000 vehicles. ^ a b c Canadian NewsWire (August 6, 2002). Ontario government investing $401 million to upgrade Highway 401 (Report). Ministry of Transportation of Ontario. Highway 401 is one of the busiest highways in the world and represents a vital link in Ontario's transportation infrastructure, carrying more than 400,000 vehicles per day through Toronto. ^ a b c d e f Thün, Geoffrey; Velikov, Kathy. "The Post-Carbon Highway". Alphabet City. Archived from the original on July 5, 2010. Retrieved January 2, 2012. It is North America's busiest highway, and one of the busiest in the world. The section of Highway 401 that cuts across the northern part of Toronto has been expanded to eighteen lanes, and typically carries 420,000 vehicles a day, rising to 500,000 at peak times, as compared to 380,000 on the I-405 in Los Angeles or 350,000 on the I-75 in Atlanta (Gray). ^ a b c d e f g h i j k l m Shragge pp. 93–94. ^ "Ontario Provincial Highways Traffic Volumes On Demand". www.raqsa.mto.gov.on.ca. Archived from the original on December 17, 2017. Retrieved January 6, 2018. ^ a b c d e f g h i j k l m n o "Highway 401: The story". John G. Shragge. 2007. Archived from the original on March 28, 2008. Retrieved February 12, 2010. ^ a b "Engineering Feats: 401 is the busiest highway in North America". The Midland Free Press. Sun Media. 2008. Archived from the original on July 14, 2011. Retrieved March 5, 2010. ^ Ministry of Transportation (2003). ^ a b c Google (March 5, 2010). "Driving directions from Toronto, ON to Montreal, QC" (Map). Google Maps. Google. Retrieved March 5, 2010. ^ Ministry of Transportation (2003), section T18–19. ^ a b "$3.8B to build Gordie Howe bridge, complete by end of 2024". CBC News. September 28, 2018. Retrieved September 29, 2018. ^ a b c d e f g h i j k Ontario Back Road Atlas (Map). Cartography by MapArt. Peter Heiler Ltd. 2010. ISBN 978-1-55198-226-7. ^ Queen's Printer for Ontario (1969). Ontario Official Road Map (Map). Government of Ontario. ^ "Location and Geography of Sarnia–Lambton". Government of Ontario. Archived from the original on July 1, 2011. Retrieved May 7, 2011. ^ Planning Department. "Land Use History". City of Windsor. Archived from the original on May 18, 2012. Retrieved April 2, 2012. ^ "Thames River: Fact Sheet". The Canadian Heritage Rivers System. Archived from the original on April 26, 2012. Retrieved August 5, 2010. ^ Hall, Joseph (October 2, 1999). "Boredom becomes a killer on 401 ; Straight and smooth, 'carnage alley' encourages a lethal lack of attention". News. The Toronto Star. p. 1. Archived from the original on November 7, 2012. Retrieved March 24, 2010. ^ "Crash area long known as 'Carnage Alley'". News. The Toronto Star. June 8, 2000. p. A. 4. Archived from the original on November 7, 2012. Retrieved March 24, 2010. ^ a b c Ministry of Transportation of Ontario (March 2007). Canada and Ontario Making Improvements to Highway 401 in Essex County (Report). Canadian News Wire. ^ Ministry of Transportation of Ontario (June 26, 2006). "Canada and Ontario Improving Highway 401 in London". Transport Canada. Archived from the original on October 21, 2012. Retrieved March 14, 2010. ^ a b London & Area (Map). MapArt. 2008. ISBN 978-1-55368-648-4. ^ Ministry of Transportation (2003), section R23–24. ^ a b Carter-Whitney, Maureen; Esakin, Thomas C. (2010). Ontario's Greenbelt in an International Context (PDF) (Report). Canadian Institute for Environmental Law and Policy. p. 7. ISBN 978-0-9812103-4-6. Archived (PDF) from the original on July 24, 2011. Retrieved May 5, 2010. ^ a b Rand McNally 2007, p. 4. ^ "Directions". Yorkdale Shopping Centre. Archived from the original on May 14, 2011. Retrieved March 10, 2011. ^ "Directions". Scarborough Town Centre. Archived from the original on May 12, 2009. Retrieved March 10, 2011. ^ "Directions / Mall Hours". Pickering Town Centre. Archived from the original on March 9, 2011. Retrieved March 10, 2011. ^ a b c d e f MapArt (2008). Golden Horseshoe (Map). Peter Heiler Ltd. pp. 103, 107–112, 266–267, 459, 466. § E3–K44, R8–S16, E44–F46. ISBN 978-1-55198-877-1. ^ Lorenz, Matt; Elefteriadou, Lily (July 2000). "A Probabilistic Approach to Defining Freeway Capacity and Breakdown" (PDF). Fourth International Symposium on Highway Capacity, Proceedings. The Pennsylvania Transportation Institute: 85. Archived (PDF) from the original on December 7, 2010. Retrieved June 10, 2010. ^ Yagar, Sam; Hui, Richard (January 26, 2007). "Systemwide Analysis of Freeway Improvements". Transportation Research Record. 1554: 172–183. doi:10.3141/1554-21. ISSN 0361-1981. Archived from the original on January 28, 2013. Retrieved April 23, 2010. ^ Ministry of Transportation of Ontario. "About COMPASS: Systems in Operation". Toronto (Highway 401) COMPASS System. Government of Ontario. Archived from the original on February 14, 2010. Retrieved March 1, 2010. ^ Ministry of Transportation of Ontario. "Freeway Traffic Management Systems". Government of Ontario. Archived from the original on December 15, 2008. Retrieved March 1, 2010. ^ Ministry of Transportation of Ontario. "Interactive Map". Traffic Cameras. Government of Ontario. Archived from the original on June 7, 2011. Retrieved March 1, 2010. ^ Google (April 28, 2009). "Highway 401 between the Highway 403 and 410 junction and Highway 427" (Map). Google Maps. Google. Retrieved April 28, 2009. ^ Toronto Transportation Plan (Map). City of Toronto. 1959. ^ Google (April 28, 2009). "Highway 401 between Highway 409 and Brock Road" (Map). Google Maps. Google. Retrieved April 28, 2009. ^ M.M Dillon Limited (July 1983). "Executive Summary". Don Valley Corridor Transportation Study (Report). Metropolitan Toronto Technical Transportation Planning Committee. p. iii. nearly 52% of the vehicles entering the [study] corridor arrived via Highway 401. ^ a b Google (June 10, 2010). "Reduction of through-lanes on Highway 401 near Salem Road in Ajax" (Map). Google Maps. Google. Retrieved June 10, 2010. ^ Highway 401 Class Environmental Assessment and Preliminary Design from Salem Road to Brock Street. Ministry of Transportation of Ontario. ^ Follert, Jillian (October 10, 2009). "Oshawa man frustrated by empty bridge during repatriations". Oshawa This Week. Metroland Media Group. Archived from the original on July 16, 2011. Retrieved December 30, 2011. ^ "Notice of Construction at Hwy 401 in City of Oshawa and Bowmanville". Ontario Trucking Association. May 27, 2011. Archived from the original on March 24, 2012. Retrieved June 25, 2011. ^ Google (May 11, 2010). "Highway 401 from Highway 35 / 115 junction to Cobourg" (Map). Google Maps. Google. Retrieved May 11, 2010. ^ Peter Heiler Ltd (2009), section C59. ^ a b c Shragge p. 89. ^ Peter Heiler Ltd (2010), pp. 37, 50, section A59–C61. ^ Peter Heiler Ltd (2010), p. 50, section X64–Y64. ^ Peter Heiler Ltd (2010), p. 69, section S73–T74. ^ Ministry of Transportation of Ontario (2010). "Provincial Highway Traffic Volumes 1988–2010". Government of Ontario. Archived from the original on October 4, 2013. Retrieved October 1, 2013. ^ A.A.D.T. Traffic Volumes 1955–1969 And Traffic Collision Data 1967–1969 (Report). Department of Highways. 1970. pp. 5–11. ^ "Highway 401 West of Hurontario". Google Maps. Retrieved March 12, 2019. ^ a b c Ministry of Transportation of Ontario (September 13, 2008). "Contract #: 2008–4009". Government of Ontario. Archived from the original on March 17, 2010. Retrieved March 11, 2010. ^ a b Emery pp. 179–182. ^ a b Filey, Mike (November 20, 2011). "Road Pioneers of the Past". The Toronto Sun. p. 44. ^ "Toronto–Hamilton Highway Proposed". The Toronto World. 34 (12125). January 22, 1914. p. 14. Retrieved February 9, 2010. ^ Shragge p. 55. "...the Toronto-to-Hamilton highway which, when completed in 1917, was both Ontario's first concrete highway and one of the longest such inter-city stretches in the world." ^ "Increased Volume of Traffic". County And Suburbs. Toronto World. 40 (14472). June 26, 1920. p. 7. Retrieved February 12, 2010. ^ a b Shragge pp. 79–81. ^ "Hopes to Improve Roads". The Gazette. 165 (42). Montreal. February 18, 1936. p. 14. Retrieved February 9, 2010. ^ English, Bob (March 16, 2006). "Remember that 'little four-lane freeway?'". Globe And Mail. Toronto. Archived from the original on September 30, 2007. Retrieved November 8, 2017. ...the freeway concept was promoted by Hamiltonian Thomas B. McQuesten, then the highway minister. The Queen Elizabeth Way was already under construction, but McQuesten changed it into a dual-lane divided highway, based on Germany's new autobahns. ^ "Highway Conditions In Eastern Ontario". The Ottawa Citizen. 94 (127). Southam Newspapers. November 13, 1936. p. 29. Retrieved February 16, 2010. ^ "Road Convention Dates Announced". The Gazette. Montreal. June 7, 1938. Retrieved February 10, 2010. ^ a b "Ontario To Bar All Gas Stands On Speedways". The Gazette. 167 (214). Montreal. September 7, 1938. pp. 1, 19. Retrieved February 12, 2010. ^ "Debts Conversion Urged By Hepburn". The Gazette. 67 (296). Montreal. September 12, 1938. p. 10. Retrieved February 17, 2010. ^ "Bypassing Approved". The Gazette. 167 (214). Montreal. September 7, 1938. p. 19. Retrieved March 16, 2010. ^ Annual Report (Report). Department of Highways. April 1942. p. 9. ^ Staff (May 6, 1942). "To Open Highway Soon". The Toronto Star. p. 15. ^ Woodsworth, Charles J. (October 17, 1952). "Tasteless Names For Ontario Roads". The Evening Citizen. 110 (93). Ottawa: Southam Newspapers. p. 40. Retrieved February 9, 2010. ^ "Chronology of Storm Events". Toronto and Region Conservation. July 8, 1955. Archived from the original on August 7, 2010. Retrieved March 18, 2010. ^ "Speed Limit In Ontario Now At 60". The Ottawa Citizen. 116 (281). Southam Newspapers. May 29, 1959. p. 23. Retrieved March 25, 2010. ^ a b "Link Kingston Bypass With Scenic Highway". The Ottawa Citizen. 112 (8). Southam Newspapers. July 8, 1954. p. 16. Retrieved February 9, 2010. ^ McKendry, Jennifer (2004). "Chronology of the History of Kingston". Kingston Historical Society. Archived from the original on April 26, 2012. Retrieved January 2, 2012. ^ Dales, Douglas (June 20, 1954). "Across The Map". The New York Times. pp. XX21. ^ "Toll Highways considered by Ontario". Saskatoon Star-Phoenix. The Canadian Press. January 12, 1955. p. 26. Retrieved August 30, 2013. ^ "Ontario Faces Backlog Totalling 920,000,000 In Highways Building". The Ottawa Citizen. 113 (206). Southam Newspapers. March 1, 1956. p. 23. Retrieved March 31, 2010. ^ a b c Heine, William C. (July 15, 1961). "Highway For Half Canada's Population". The Ottawa Citizen. 11 (28). Southam Newspapers. pp. 1–4, 22. Retrieved April 1, 2010. ^ "Drivers Itch To Try Out Road Link". The Ottawa Citizen. 118 (632). Southam Newspapers. July 22, 1961. p. 14. Retrieved April 1, 2010. ^ "Freeway Alters Life in Ontario". Hemisphere Business Review. New York Times. January 17, 1964. p. 45. Archived from the original on June 5, 2011. Retrieved April 2, 2010. ^ "401 May Be Renamed Macdonald-Cartier". News. The Globe and Mail. 121 (35, 907). Toronto. January 9, 1965. p. 1. Premier John Robarts is expected to announce Monday at the 150th birthday dinner for Sir John A. Macdonald that Highway 401 will be renamed the Macdonald–Cartier Freeway. The naming will be in honour of Canada's first prime minister and George-Étienne Cartier, the Quebec leader in confederation. ^ "Chronology". Annual Report (Report). Department of Highways. March 31, 1966. p. 324. ^ "Heritage issue drives highway sign debate". The Record. Kitchener. December 23, 1997. p. B5. ^ "Macdonald-Cartier Freeway Act". Ontario Legislative Assembly. June 11, 2003. Archived from the original on June 10, 2011. Retrieved June 15, 2010. ^ Annual Report 1983–1984 (Report). Ontario Ministry of Transportation and Communications. March 31, 1984. Archived from the original on April 24, 2016. Retrieved June 24, 2010. ^ Josey, Stan (February 10, 1987). "12 lanes to solve tie-ups on 401". Neighbors. The Toronto Star. p. E1. Archived from the original on October 26, 2012. Retrieved April 10, 2010. ^ Byrne, Caroline (July 4, 1989). "Highway 401 work will cause chaos for 8 more years". Neighbors. The Toronto Star. p. E2. Archived from the original on October 26, 2012. Retrieved April 10, 2010. ^ "Highway 401 Widening to Express/Collector System" (PDF). LEA Consulting. Archived from the original (PDF) on July 6, 2011. Retrieved April 6, 2010. ^ Josey, Stan (July 4, 1989). "Diverse area faces many challenges". News. The Toronto Star. p. 1. Archived from the original on October 26, 2012. Retrieved April 10, 2010. ^ Crone, Greg (February 11, 1993). "Highway 401 from Kitchener to Toronto headed for six lanes, straight through". Kitchener–Waterloo Record. p. A1. Archived from the original on November 7, 2012. Retrieved April 17, 2010. ^ "Highway 401 from Kitchener to Toronto headed for six lanes, straight through". The Toronto Star. February 3, 1996. p. A3. Archived from the original on October 26, 2012. Retrieved April 10, 2010. ^ "Highway 401 will get major reconstruction". Kitchener–Waterloo Record. May 15, 1991. p. A1. Archived from the original on October 26, 2012. Retrieved April 10, 2010. ^ Malloy, Gerry (October 16, 1993). "Highway chevrons aimed at curbing crashes". The Toronto Star. p. 16, section L. Archived from the original on June 5, 2011. Retrieved February 26, 2010. ^ Google (February 27, 2010). "Chevrons on Highway 401 near Whitby. No signs indicate their use." (Map). Google Maps. Google. Retrieved February 27, 2010. ^ a b Crabtree, Joe (Autumn 1995). "Advantage I-75 Prepares to Cut Ribbon on Electronic Clearance". 59 (2). United States Federal Highway Administration. Archived from the original on October 21, 2011. Retrieved March 8, 2011. ^ ITS America (Winter 1995). "Along The Road". 59 (3) (ADVANTAGE I-75 Testing Completed ed.). United States Federal Highway Administration. Archived from the original on October 19, 2011. Retrieved February 27, 2010. ^ Transport Canada (November 1999). "Where is Canada Now?". En Route to Intelligent Mobility (PDF) (Report). Government of Canada. p. xiii. Archived (PDF) from the original on July 6, 2011. Retrieved March 8, 2011. ^ a b c Seidel, Jeff (December 21, 1999). "'Carnage Alley': Ontario's Highway 401 was a road of death in 1999". Knight-Ridder Newspapers. Archived from the original on March 12, 2012. Retrieved February 25, 2015. ^ Scott, Cameron (December 15, 2010). "What is Lake Effect Snow". Sciences 360. Archived from the original on July 4, 2014. Retrieved February 25, 2015. ^ Annett, Doug (March 2000). "Highway Safety: A Drive in the Country". Canadian Occupational Health and Safety Magazine. Business Information Group. Archived from the original on July 27, 2011. Retrieved February 25, 2015. ^ "Killer highway claims ten more car smash victims". The Birmingham Post. September 4, 1999. Retrieved February 22, 2010. ^ a b Robson, Dan (August 30, 2009). "Reliving the horror of the 401 fog". The Toronto Star. Archived from the original on February 26, 2015. Retrieved February 25, 2015. ^ McCann, Wendy (August 31, 1999). "Killer Highway 'Pleasant' To Drive". The Hamilton Spectator. p. 3, section C. Archived from the original on November 7, 2012. Retrieved February 22, 2010. ^ "401 Incident: Timeline". Windsor Fire and Rescue Services. Archived from the original on September 28, 2011. Retrieved February 25, 2015. ^ "Cleanup continues after horrific highway crash". Canadian Broadcasting Corporation. September 5, 1999. Archived from the original on September 24, 2015. Retrieved February 22, 2010. ^ "Ontario puts more money into highways than ever before". Today's Trucking. Newcom Business Media. January 5, 2000. Archived from the original on February 26, 2015. Retrieved February 25, 2015. ^ "Upgrades, extra police planned for Canada 401". The Blade. Toledo, Ohio. September 18, 1999. p. 8. Retrieved February 22, 2010. ^ a b Robson, Dan (August 30, 2009). "Improvements made to 'Carnage Alley'". The Toronto Star. Archived from the original on September 5, 2009. Retrieved February 19, 2010. ^ a b "Stretch of 401 to be renamed 'Highway of Heroes'". CTV Toronto. August 24, 2007. Archived from the original on January 6, 2011. Retrieved February 3, 2010. ^ a b Office of the Premier (September 7, 2007). 'Highway of Heroes' Signs Unveiled Along Highway 401 (Report). Government of Ontario. Archived from the original on July 17, 2011. Retrieved February 3, 2010. ^ "Hwy. 401 Will Be Renamed 'Highway of Heroes' to Honour Soldiers". City News. August 24, 2007. Archived from the original on June 29, 2011. Retrieved February 3, 2010. ^ Fisher, Pete (August 14, 2011). "Salute to 'Brothers'". The Toronto Sun. pp. 6–7. ^ Warmington, Joe (June 23, 2007). "Our own Trail of Tears". News. The Toronto Sun. p. 3. ^ Fisher, Pete (July 13, 2007). "Highway of Heroes: Let's make it official". Northumberland Today. Sun Media. Archived from the original on November 9, 2017. Retrieved November 8, 2017. ^ "Section of 401 to be renamed for fallen". The Record. Kitchener. August 24, 2007. Retrieved February 3, 2010. ^ Cassin, J. "Highway of Heroes officially dedicated in Port Hope". Northumberland Today. Sun Media. ^ "Evacuees begin returning home after fireball consumes Toronto propane plant". CanWest News Service. August 10, 2010. Archived from the original on August 25, 2008. Retrieved February 21, 2010. Ontario Provincial Police spokesman Sgt. Cam Woolley said the incident triggered the biggest closure of the 401 in the highway's history. ^ Taylor, Bill (August 11, 2008). "Residents return after blast". The Toronto Star. Archived from the original on August 10, 2008. Retrieved February 21, 2010. ...a 10-kilometre stretch of Canada's busiest highway, the 401, was shut down as was the southern end of Highway 400, which carries people to and from cottage country. The highway was re-opened at around 8 p.m., but the restricted ramps will remain closed for some time. ^ "Highway 401 Reopens Following Propane Facility Blast". CityNews. August 10, 2010. Archived from the original on May 22, 2010. Retrieved February 21, 2010. ^ a b Ministry of Transportation of Ontario (September 7, 2005). "Contract #: 2005–2014". Government of Ontario. Archived from the original on October 30, 2007. Retrieved February 22, 2010. ^ "Stevenson interchange open". Oshawa This Week. Metroland Media Group. September 14, 2007. Archived from the original on October 29, 2007. Retrieved October 4, 2007. ^ Ministry of Transportation of Ontario (July 14, 2008). "Contract #: 2008–3004". Government of Ontario. Archived from the original on October 30, 2007. Retrieved March 14, 2010. ^ Cornies, Larry (December 4, 2010). "'Need for speed' creates havoc on 401". London, Ontario, Canada: London Free Press. Archived from the original on July 13, 2011. Retrieved June 8, 2011. Except for a few crowning touches that will wait until spring, the massive construction project on a 20-kilometre stretch of Hwy. 401 just east of Woodstock is finally finished. ^ a b Detroit River International Crossing Study team. "DRIC Reports (Canada)". Detroit River International Crossing Project. Archived from the original on May 4, 2010. Retrieved February 26, 2010. ^ "Windsor's 'Garden of Eden'". Windsor Star. October 9, 2007. Archived from the original on November 8, 2012. Retrieved February 26, 2010. ^ Pearson, Craig (February 14, 2008). "Province buying up land for 401 extension". Windsor Star. p. 1, section A. Archived from the original on December 30, 2010. Retrieved February 26, 2010. ^ "Couple worries new parkway will surround their home". Canadian Broadcasting Corporation. November 27, 2009. Archived from the original on November 7, 2012. Retrieved December 14, 2011. ^ Government of Canada (March 3, 2008). "Border transportation partnership reaches milestone". Transport Canada. Archived from the original on February 25, 2010. Retrieved February 26, 2010. ^ Liltwin, Natalie (June 3, 2009). "DRIC controversy goes on". Windsor Star. Canwest Publishing. Archived from the original on June 11, 2009. Retrieved June 16, 2010. ^ "Ambassador Bridge boss sues Canada, U.S." CBC News. March 25, 2010. Archived from the original on April 9, 2011. Retrieved June 16, 2010. ^ Kristy, Dylan (May 5, 2011). "Sierra Club, bridge lose bid to derail DRIC". The Windsor Star. Archived from the original on April 23, 2012. Retrieved January 2, 2012. ^ a b Detroit River International Crossing Study team (May 1, 2008). "The DRIC Announces Preferred Access Road" (Press release). URS Corporation. Archived from the original on December 2, 2010. Retrieved February 26, 2010. ^ Detroit River International Crossing Study team (May 1, 2008). "Parkway Map" (PDF). URS Corporation. Archived from the original (PDF) on July 6, 2011. Retrieved February 26, 2010. ^ "Ground Breaks on Windsor-Essex Parkway". Today's Trucking. August 19, 2011. Archived from the original on May 27, 2015. Retrieved May 27, 2015. ^ Battagello, Dave (November 28, 2012). "Gray 'Moved' by Tribute to Name Parkway in his Honour". The Windsor Star. Archived from the original on December 1, 2012. Retrieved December 2, 2012. ^ "What's Ahead This Spring" (PDF). The Rt. Honourable Herb Gray Parkway (Windsor-Essex Parkway) Web Site. Archived from the original (PDF) on May 28, 2015. Retrieved April 21, 2015. ^ Battagello, Dave (June 24, 2015). "Herb Gray Parkway Opening This Weekend to Traffic". The Windsor Star. Archived from the original on June 25, 2015. Retrieved June 25, 2015. ^ Ministry of Transportation of Ontario (November 20, 2015). "Highway 401 Section of the New Rt. Hon. Herb Gray Parkway Now Complete" (PDF) (Press release). Ministry of Transportation of Ontario. Archived from the original (PDF) on March 4, 2016. Retrieved March 10, 2016. ^ Thompson, Chris (December 16, 2015). "Meeting Gauges Feedback on How Highway 401 Should Cross Ojibway Parkway". Windsor Star. Archived from the original on December 25, 2015. Retrieved March 10, 2016. ^ Battagello, Dave (May 22, 2013). "Canada to start buying property in Delray for DRIC bridge". Windsor Star. Archived from the original on August 7, 2013. Retrieved August 4, 2013. ^ "Gordie Howe bridge will be the longest cable-stayed bridge in North America". CBC News. July 5, 2018. Retrieved July 5, 2018. ^ a b c Hertz, Barry (July 25, 2007). "Province plans to create 6-lane Highway 401". The National Post. Toronto. ^ Ministry of Transportation of Ontario (2008). "Borders and Gateways". Government of Ontario. Archived from the original on August 5, 2010. Retrieved March 15, 2010. ^ Ministry of Transportation of Ontario (August 27, 2007). "Contract #: 2007–3043". Government of Ontario. Archived from the original on October 30, 2007. Retrieved March 14, 2010. ^ a b c d London Free Press (November 12, 2015). "New Hwy. 401 interchange opens at Wonderland Road in London". Sun Media. Archived from the original on November 16, 2015. Retrieved November 12, 2015. The next phase will involve a reconstruction of the interchange at Veteran's Memorial Parkway and extending the highway to Wilton Grove Road. The project should begin in 2017, followed by the reconstruction of the Highbury Road and Colonel Talbot Road exits. ^ Transportation Division (November 13, 2007). "Veterans Memorial Parkway, Environmental Study, Official Plan and Zoning Amendment" (PDF). Veterans Memorial Parkway: Preferred Alternative to Highway 401/VMP interchange. City of London, Ontario. Archived from the original (PDF) on December 17, 2010. Retrieved April 26, 2010. ^ "London Long Term Transportation Corridor Protection Study" (PDF). City of London, Ontario. April 4, 2001. Archived from the original (PDF) on June 21, 2011. Retrieved April 27, 2010. Note that the proposed widening of Highway 401 to eight lanes through London could reduce the need to widen crossing roadways along Exeter Road and Dingman Drive. ^ Record staff (September 3, 2014). "Cambridge Committee Grants Weekend Noise Exemption for Hwy. 401 Work". Waterloo Region Record. Kitchener. Archived from the original on November 12, 2014. Retrieved November 12, 2014. During the next four years, construction crews will widen Highway 401 from six to 10 lanes and rebuild four overpasses that stretch across the highway. ^ Record Staff (June 5, 2015). "Highway 401 Widening Work Starts Monday in Cambridge". The Record. Waterloo Region: Metroland Media. Archived from the original on July 14, 2016. Retrieved November 8, 2017. ^ Planning Housing and Community Services, Transportation Planning (March 31, 2009). "Highway 8 and Highway 401 Interchange Improvements". Region of Waterloo. Archived from the original on June 13, 2012. Retrieved January 2, 2012. ^ a b Ministry of Transportation of Ontario (May 24, 2007). "Ontario's High Occupancy Vehicle Lane Network: Summary of the Plan for the 400-Series Highways in the Greater Golden Horseshoe". Government of Ontario. Archived from the original on October 29, 2007. Retrieved February 25, 2010. Figure 2 proposes a vision for "growing the corridors" by building on existing HOV lanes. This involves extending the HOV lanes on Highways 400 and 404 farther north and adding lanes to other key sections such as Highway 401 in Peel Region. ^ Swayze, Kevin (December 4, 2011). "Highway 401 Carpool Lanes Proposed". The Record. Kitchener. Archived from the original on December 6, 2011. Retrieved December 4, 2011. ^ Ministry of Transportation of Ontario (August 19, 2009). "Contract #: 2009–2031". Government of Ontario. Archived from the original on October 30, 2007. Retrieved February 22, 2010. ^ Ministry of Transportation of Ontario (January 29, 2014). "Highway 401/Mavis Road Interchange and New Ramps at the Highway 401/410/403 Interchange" (PDF). Government of Ontario. Archived (PDF) from the original on February 2, 2014. Retrieved January 30, 2014. ^ Ministry of Transportation of Ontario (November 30, 2008). "Contract #: 2008–2017". Government of Ontario. Archived from the original on October 30, 2007. Retrieved February 22, 2010. ^ Ministry of Transportation of Ontario (July 22, 2009). "Contract #: 2009–2029". Government of Ontario. Archived from the original on October 30, 2007. Retrieved February 22, 2010. ^ Totten Sims Hubicki Associates (August 17, 2009). "Appendix D: Recommended Design Plans". Highway 407 Environmental Assessment, West Durham Link at Highway 401 (PDF) (Report). Ministry of Transportation of Ontario. p. 7. Archived from the original (PDF) on July 7, 2011. Retrieved February 17, 2010. ^ Totten Sims Hubicki Associates (August 17, 2009). "Appendix D: Recommended Design Plans". Highway 407 Environmental Assessment, East Durham Link at Highway 401 (PDF) (Report). Ministry of Transportation of Ontario. p. 9. Archived from the original (PDF) on July 7, 2011. Retrieved February 17, 2010. ^ Szekely, Reka (June 30, 2009). "Highway 401 between Ajax and Whitby to be widened". Ajax-Pickering News Advertiser. Metroland Media Group. Archived from the original on May 23, 2012. Retrieved February 17, 2010. ^ "Highway 401: Brock to Courtice". Highway 401: Brock to Courtice. Archived from the original on June 20, 2017. Retrieved February 5, 2019. ^ "Southern Highways Program 2015-2019" (PDF). Ontario Ministry of Transportation. Archived (PDF) from the original on March 4, 2016. ^ Ministry of Transportation of Ontario (October 14, 2008). "Contract #: 2008–4006". Government of Ontario. Archived from the original on March 17, 2010. Retrieved March 11, 2010. ^ Ministry of Transportation of Ontario (November 9, 2009). "Contract #: 2009–4003". Government of Ontario. Archived from the original on March 17, 2010. Retrieved March 11, 2010. ^ MacDonald, Valerie (August 23, 2016). "Hwy. 401 construction project on schedule". Northumberland Today. Archived from the original on August 25, 2016. Retrieved August 24, 2016. ^ "HMSHost Corporation and Kilmer Van Nostrand Co. Limited Ink 50-Year Agreement to Build 23 World-Class Service Centres on Major Canadian Highways". CNW Group. April 7, 2010. Archived from the original on April 10, 2010. Retrieved June 5, 2010. ^ a b "Ontario Finalizes Plans For Highway Service Centres". Brock News. Brockville: DCE Productions. April 7, 2010. Archived from the original on July 6, 2011. Retrieved April 9, 2010. ^ Ministry of Transportation (2003), section T20, S21, R23–R24, Q27–Q28, P31, O33–P34, N36. ^ "ONroute Locations". Host Kilmer Service Centres. Archived from the original on October 7, 2010. Retrieved October 1, 2010. ^ a b c d e f Host Kilmer Service Centres (October 1, 2010). "First Phase of Highway 401 Service Centres Complete" (Press release). CNW Group. Archived from the original on October 4, 2010. Retrieved October 1, 2010. ^ Wightman, Ken (March 20, 2010). "Celebrating the Doomed Domes of Woodstock Service Centre". Digital Journal. Archived from the original on September 21, 2010. Retrieved September 26, 2010. ^ Caldwell, Brian (May 12, 2010). "401 service centres east of Cambridge last to be spruced up". Cambridge Reporter. Metroland Media Group. Archived from the original on July 8, 2011. Retrieved June 6, 2010. ^ a b Ministry of Transportation of Ontario (February 18, 2010). "Ontario Service Centres FAQ". Government of Ontario. Archived from the original on September 5, 2013. Retrieved September 4, 2013. ^ Norris, Mike (February 2010). "Centres forced to close". Whig Standard. Kingston: Sun Media. Archived from the original on February 4, 2013. Retrieved April 9, 2010. ^ Zajac, Ronald (January 17, 2011). "Westbound 401 Service Centre Partly Reopening". Archived from the original on January 16, 2013. Retrieved January 25, 2012. ^ a b Battagello, Dave (November 20, 2015). "Herb Gray Parkway Completed, Final Stretch to Open Saturday". Windsor Star. Archived from the original on November 21, 2015. Retrieved November 21, 2015. ^ "Committee votes to open Brimley Road". The Globe and Mail. Toronto. February 19, 1988. p. A13. ^ a b Annual Report 1983–1984 (Report). Ontario Ministry of Transportation and Communications. March 31, 1984. Archived from the original on June 26, 2014. Retrieved June 24, 2010. ^ Public and Safety Information Branch (September 6, 1974). "Opening of New Brock Road Highway 401 Interchange, Closing of Liverpool Road Highway 401 Interchange" (Press release). Ministry of Transportation and Communications. ^ a b Potter, Warren (December 10, 1985). "Ajax Commuters Get Partial Relief With New Ramps". Neighbors East Edition. The Toronto Star. p. East3. ^ "July 2018: The End Is Near" (PDF). 407 East Phase 2. Retrieved January 26, 2019. ^ Andrews, Brad (October 27, 2014). "Holt Road work in Clarington paves way for Highway 407". Metroland Media. Archived from the original on October 28, 2014. Brown, Ron (1997). Toronto's Lost Villages. Toronto: Polar Bear Press. ISBN 978-1-896757-02-5. Butorac, Yvonne (June 1, 1995). Great Exits – The 401. Erin, Ontario: Boston Mills Press. ISBN 978-1-55046-137-4. Emery, Claire; Ford, Barbara (1967). From Pathway to Skyway. Burlington, Ontario: Confederation Centennial Committee of Burlington. pp. 179–182. Archived from the original on June 14, 2011. Retrieved May 3, 2010. Filey, Mike (1994). Toronto sketches 3: the way we were. Toronto: Dundurn Press. pp. 61–62. ISBN 978-1-55002-227-8. Retrieved February 10, 2010. McIlwraith, Thomas F. (1997). Looking for old Ontario: two centuries of landscape change. Toronto: University of Toronto Press. ISBN 978-0-8020-7658-8. Retrieved March 13, 2010. 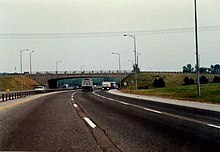 '401' The Macdonald–Cartier Freeway. Toronto: Ministry of Transportation and Communications. 1972. Shragge, John; Bagnato, Sharon (1984). From Footpaths to Freeways. Toronto: Ontario Ministry of Transportation and Communications, Historical Committee. ISBN 978-0-7743-9388-1. Stamp, Robert M. (1987). QEW: Canada's First Superhighway. Erin, Ontario: Boston Mills Press. ISBN 978-0-919783-84-3. Geomatics Office (2003). Southern Ontario Road Maps (Map). Cartography by Bryan Simmons, Lori-Anne Martin. Ministry of Transportation. Retrieved January 5, 2012. Eastern Ontario (Map). Cartography by MapArt. Peter Heiler Ltd. 2009. § C59. ISBN 978-1-55368-222-6. Ontario Back Road Atlas (Map). Cartography by MapArt. Peter Heiler Ltd. 2010. ISBN 978-1-55198-226-7. Toronto & area map book (Map). Cartography by Perly's. Rand McNally. 2007. p. 4. ISBN 978-0-88640-928-9. Wikimedia Commons has media related to Ontario Highway 401 and Highway of Heroes.